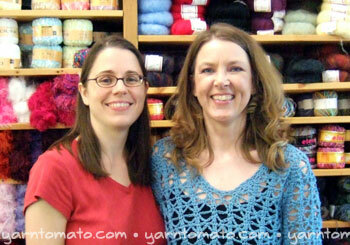 Amy and I have been running Crochetville [est. 2004] together for well over a year and she has been fantastic to work with. We talk nearly every day on the phone: we discuss and decide and plan. But we hadn’t met in person until a few weeks ago. Amy was on a summer vacation with her family in Emerald Isle, a short drive away from my town. …and, of course, had our picture taken! Amy’s wearing a top she crocheted, the Bell Sleeved Pullover by Doris Chan from the Crochet Collection 2006 booklet published by Tahki Stacy Charles. Made from Tahki Cotton Classic in the color (Amy thinks) blue slate #3818. 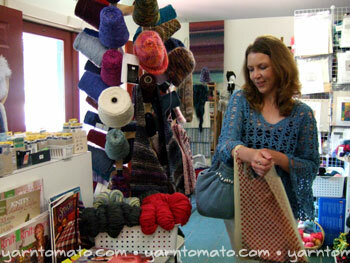 And she crocheted her purse, too, a blue Fat Bottom Bag. Me, I’m in my “uniform,” a V-neck T-shirt! We intended to hit the bead shop after that, but instead decided we’d better head out to pick up my son from the babysitter and some lunch from BearTown. For my little guy’s sake (he fell asleep in the car) we ordered carryout and ate at my place. We wanted a really good photo of us together, so we did our own little photo shoot in my backyard. With the two of us, a tripod, and an eager toddler, it wasn’t easy but just laughed our way through it! Our time together went by in a flash. I look forward to our next visit! Donna, thank you SO MUCH for posting this! I am so glad you two finally met and it is so nice to see both of you!! Oh my goodness, Donna! I was so amazed to see your blog title (on Karen Whooley’s blog). I have been running a series of whimsical stories about a tomato doll and her adventures on my blog… Tottie Tomato has taken on a life of her own, and has given me a whole new appreciation for tomatoes. 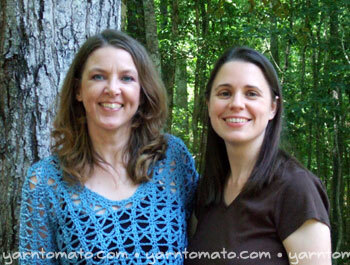 So, to see that your blog is the yarn tomato just floored me. And, also…. thanks for all the hard work you do at Crochetville! 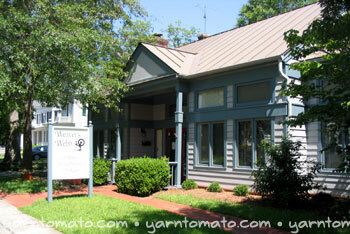 Yay for tomatos, yay for yarn, yay for crocheville! This is so sweet. Reminds me of a woman I have worked with now for over five years on a discussion board. At times over the years we have spoken daily on the telephone, yet our eyes have never met face-to-face. So good you two were able. Oh, and thanks for your hard work on C-ville. How great that you got to meet….